One of the best ways to restore your smile to something that you are confident with is dental bonding. Dental bonding is one of the most popular services here at Philadelphia Dentistry because it is fast and affordable. If you are unfamiliar with dental bonding it is defined as placing a simple attachment of composite resin to the surface of your tooth or teeth that you want fixed to give it an all-natural, healthy look. If you are dealing with issues like gaps or spaces between your teeth, teeth that are too short or chipped, tooth discoloration and even broken teeth, then dental bonding can change your life. 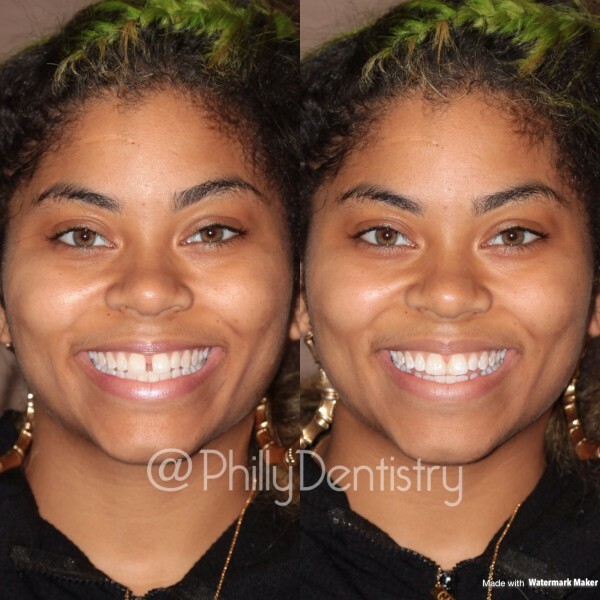 At Philly Dentistry, we can almost always do same day treatment for dental bonding and get you that smile you’ve always wanted. When you come in to our Center City, Philadelphia office one of our excellent doctors will take a look and let you know exactly what the best option is for you to restore your smile. If it’s bonding then we will fix your smile as soon as possible! Your dental bonding has the strength to last up to 10 years as long as you take care of it just like your natural teeth. Patients should avoid chewing anything hard like candies, ice and other possibly harmful foods. The process of dental bonding is very simple. Our doctors will show you a shade guide to make sure that the composite resin being used will match exactly to your natural teeth. They will then apply, mold and shape the resin to your teeth for a natural looking perfect smile. The composite resin is then hardened by a special light and then finally polished and smoothed for a flawless finish. Give us a call today to see if you are a candidate for dental bonding and get that smile you have always wanted! 215-568-6222.